Normandy has become almost synonymous with the Allied landings that marked the beginning of the end of the Nazi occupation of Europe. Because this was one of the major turning points in history, many people want to visit the places where it took place. 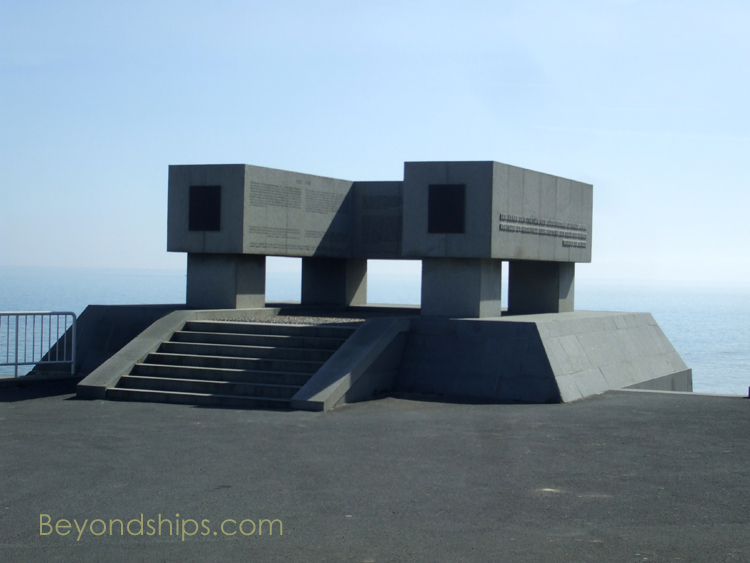 Cruise ships calling in Cherbourg and Le Harve offer shore excursions to the D-Day landing beaches. 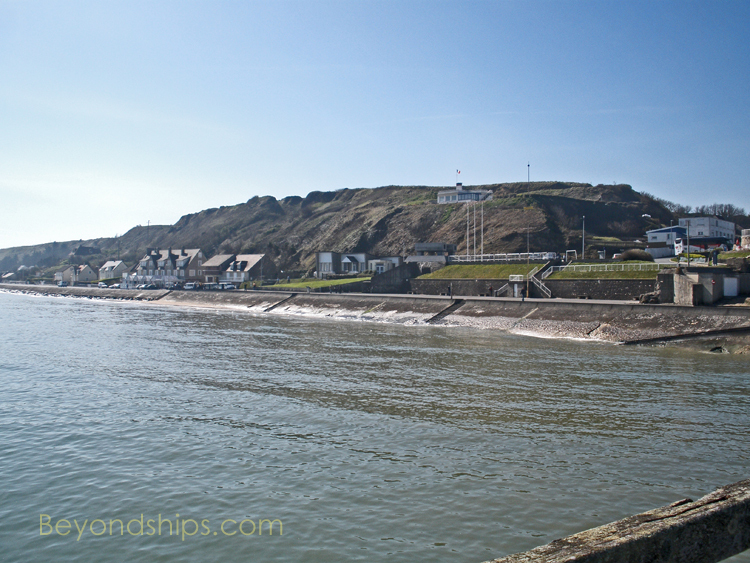 However, because this battle took place over a wide area, the tours tend to focus on either the beaches where the American forces landed (the "American beaches") or the beaches where the British and Canadian forces landed (the "British beaches"). Because the area is so spread out and because it is a mostly rural area, it is difficult to tour independently during a port call. 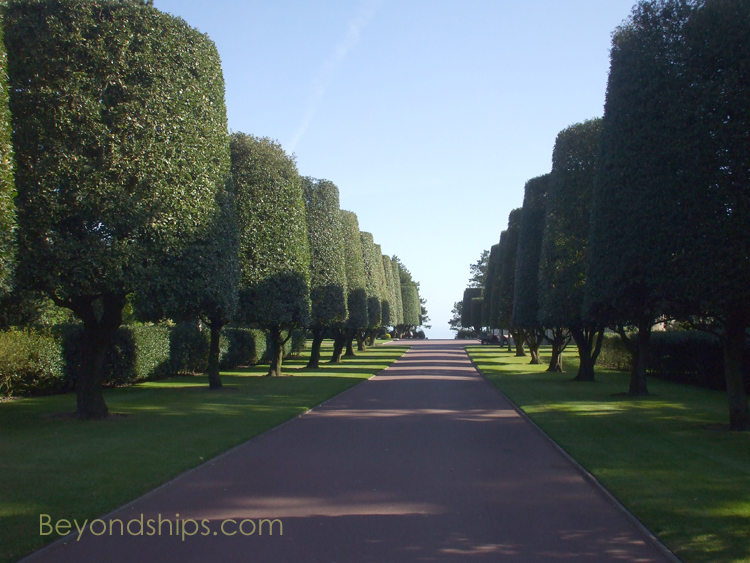 It would require either hiring a car or engaging a guide who has a car or coach. defeated and this dark era in world history ended. In addition, there are sites inland such as the Pegaus Bridge and the town of Sainte Mare Eglise where parachute and glider forces landed. Cherbourg.The photos and information on this page are from a tour of the American beaches. 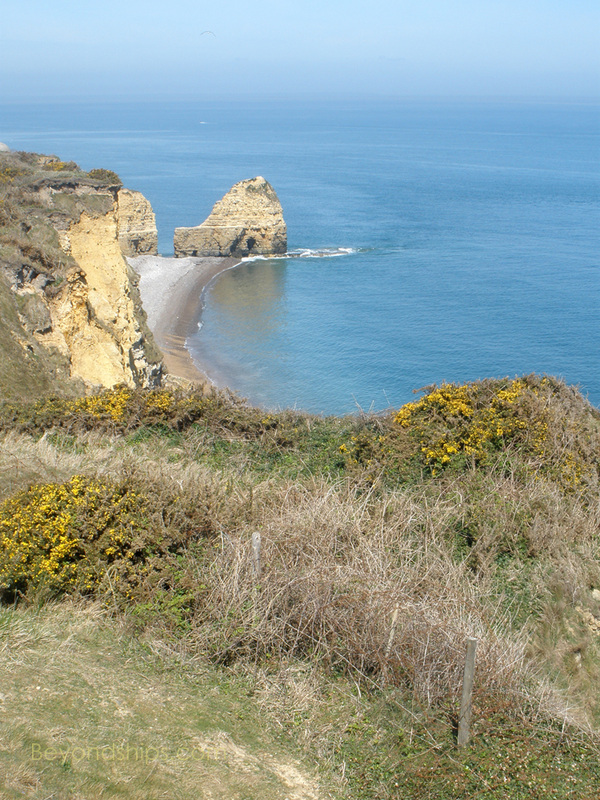 Such excursions typically include a stop at Pointe du Hoe, Omaha Beach, the American Cemetery and the Museum and War Memorial at Caen. 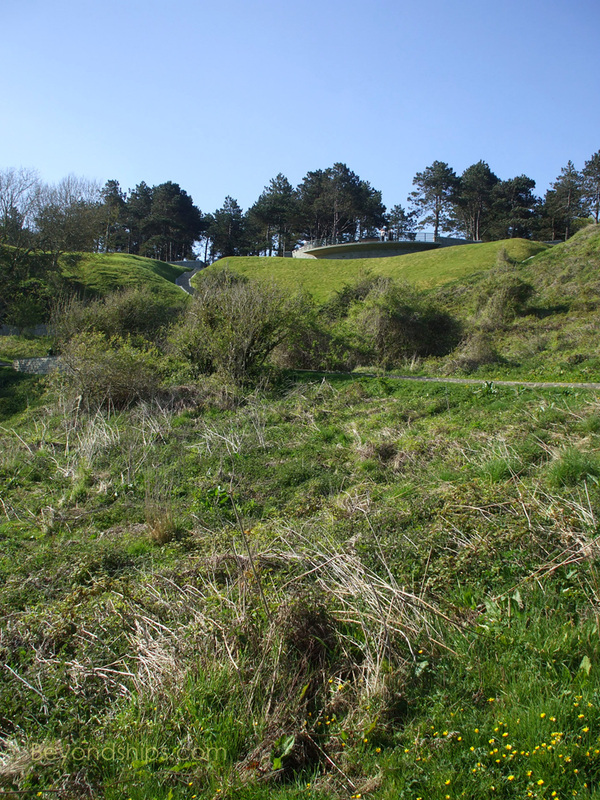 Much of the landing area has been returned to peaceful pursuits and the scars of the fighting erased. 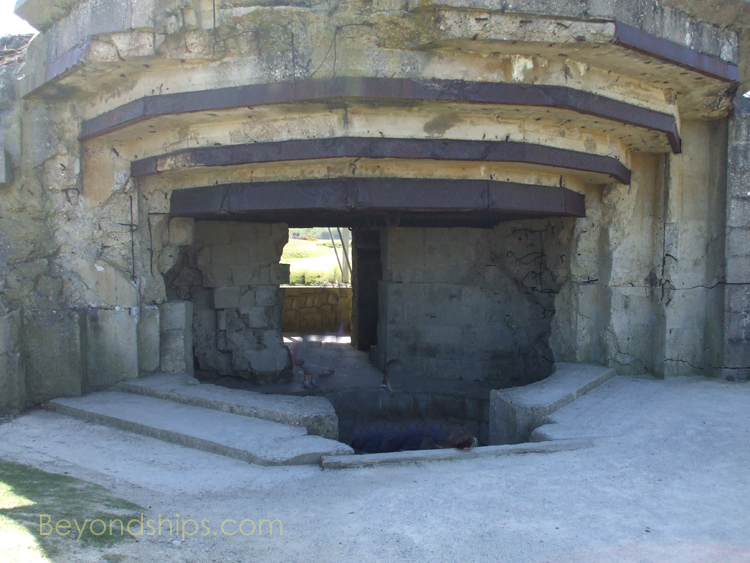 However, one exception is Pointe du Hoc where craters from bombs and naval gun fire lie between the remnants of bunkers and barbed wire. 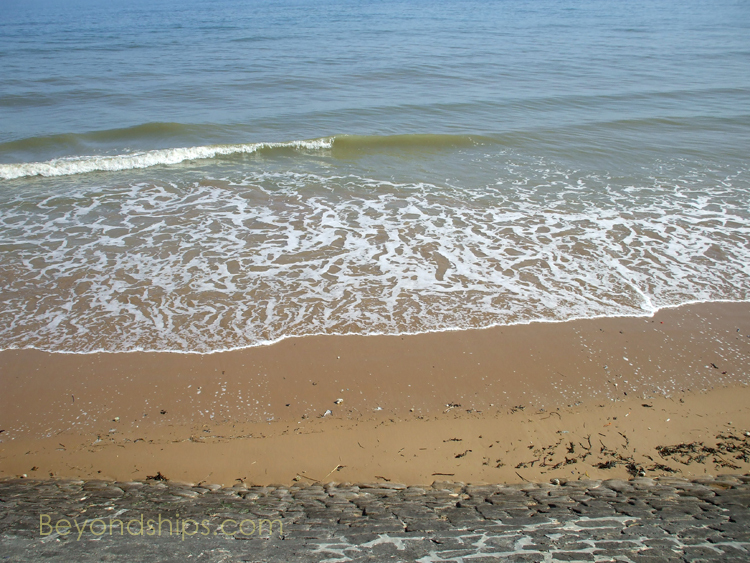 Today, the section of the Normandy coast that was code-named Omaha Beach for the D-Day landings is a quiet rustic area with only a few visible reminders of the war. However, on June 6, 1944, it was the most hard fought of the landing beaches. Indeed, at one point consideration was given to withdrawing the landing force. However, the Americans persevered and were able to break through the German defenses by the end of the day. 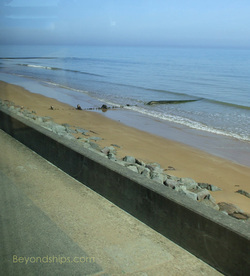 Looking at the beach from the sea, one can see why it was such a difficult position to take. After the flat beach, the land rises up quickly and steeply. 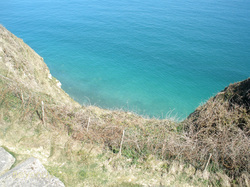 The Germans on the high ground were able to shoot down at the troops on the beach and struggling to climb the hill. In addition to the problems presented by the terrain, the defenders had fortified the area. 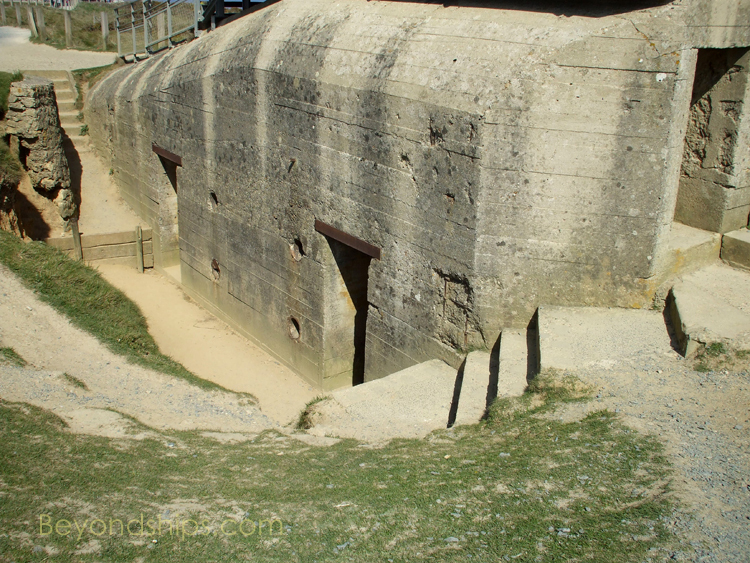 The Germans, under Field Marshal Erwin Rommel, had envisioned building an "Atlantic Wall" of fortifications all along the French Coast. 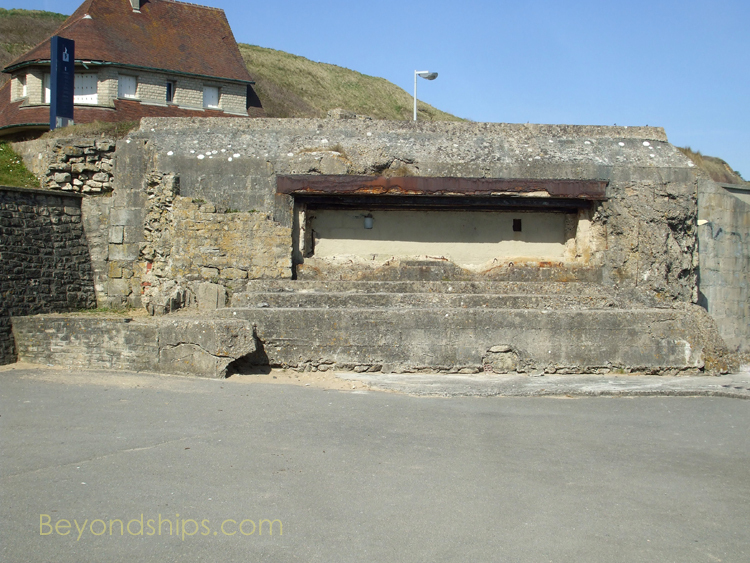 Most of it was never built but at Omaha beach there were bunkers and fortifications built into the cliffs as well as mines and obstacles on the beach. Most of these have been removed but some still remain. Several memorials have been placed along the beachfront. An important breakthrough occurred at a point along the beach just in front of where the American Cemetery is now. Left: Looking up the hill the Americans had to fight their way up to attack the Germans. Above: Looking down from the German position. 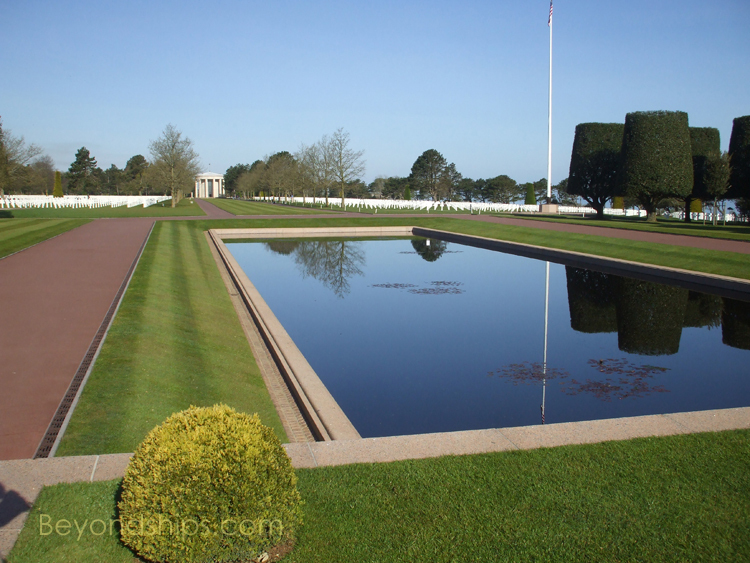 The American Cemetery is beautifully landscaped and maintained but it is a somber experience. 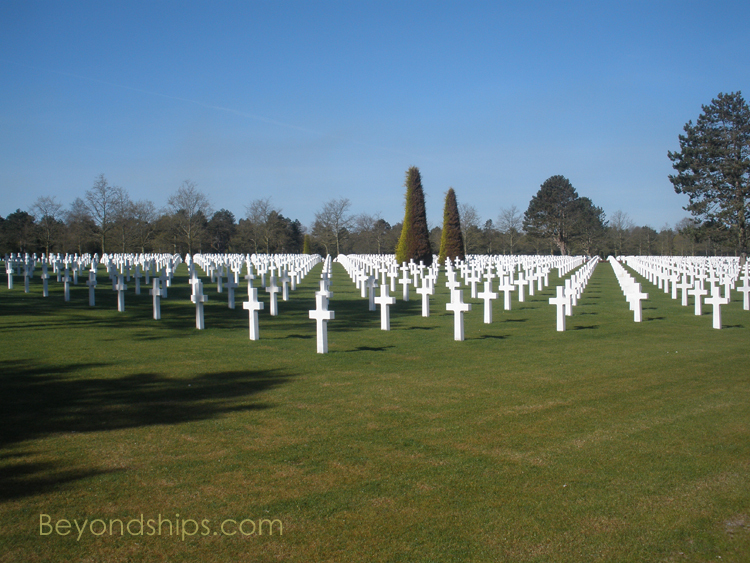 In it are the graves of 9,387 Americans who died during World War II, most of them on D-Day. There is also a memorial with the names of 1,557 people missing in action. 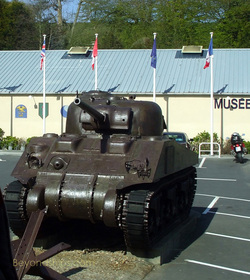 There are quite a few museums around Normandy covering various aspects of the battle. 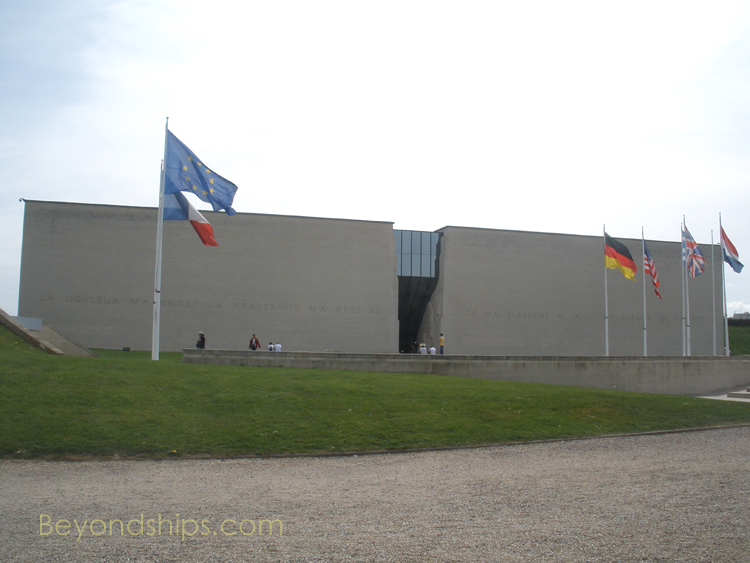 Perhaps the best known of these is Le Memorial de Caen (peace Museum) (right), which was built on the site of a major battle in the Normandy campaign. While it covers other topics as well, its exhibits seek to document and explain the Second World War, particularly in Europe.